The first in series of climbing videos in partnership with leading climbing physiotherapist Cristiano Costa looks at Thoracic Mobility. Thoracic mobility is often overlooked, but dysfunction in this area can lead to problems further upstream in the neck, shoulders and also in the lower back and hips. 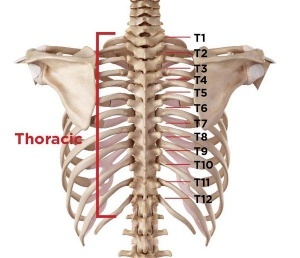 The Thoracic spine is the vertebrae between the cervical spine or neck (C1-C7) and Lumbar Spine (L1-5). For the purpose of these exercises it is those vertebrae shown in the picture we want to work on and not the neck and lower back. In this video we look at 3 exercises to help you improve your Thoracic Mobility. In this exercise we place the foam roller in the middle of our back and simple roll back and forwards as far as our shoulders. Ensure your core is engaged and repeat around 15 times. Similar to exercise one here we combine the foam roller mobilisation with reaching the arms above our head. This helps us to mobilise our shoulders as well as our Thoracic spine. Repeat 15-20 times and do 3 sets. Using the foam roller, place it under your knee locking your pelvis and lumbar spine in place. With your arms out to the side and hands together rotate one arm around so the hand gets as close to the floor as possible. Ensure this rotation is coming from your Thoracic Spine and not from your hips or lower back. This can be made slightly harder by pushing the top hand forward first before rotating. As with other mobility exercises do 3 sets of 15-20 repetitions. A variation on exercise 3, here rather than just a rotation draw a circle with your hand, this can be done either clockwise or anti-clockwise. This variation combines both the thoracic spine and shoulder to improve mobility. As previously you should do 3 sets of 15-20 repetitions.